Daniel David Palmer began practicing “magnetic healing” in Davenport, Iowa in 1886. Magnetic healing was a common healing therapy at that time, which was a cross between massage and meridian therapy based on the concepts of Chinese medicine. He applied what he learned about new developments in anatomy and physiology, and resolved inflammation of the nerves and created remedies for his patients. Palmer believed that the body has an ample supply of natural healing power that is transmitted through the nervous system. Harvey Lillard, the janitor of Palmer’s building, had lost his hearing 17 years earlier. Lillard communicated to him that he had felt something “pop” in his back when he was in a stooped position while exerting himself, and had instantly lost his hearing. Palmer believed that there was a connection between the two events. When Palmer examined Lillard, he discovered a “lump in his back.” He theorized that the dislocated vertebra blocked the spinal nerves controlling the inner ear, and that if the vertebra was put back in place the nerve pathways would reopen. On September 18, 1895, Palmer applied a firm pressure to Lillard’s back with his hands, and Lillard regained his hearing. The first chiropractic adjustment was made. 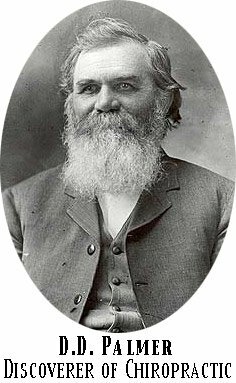 The word chiropractic was created by Palmer’s friend and patient, Reverend Samuel Weed. He combined the Greek words cheiro (hand) and praktikos (practical or do), creating the term chiropractic, which means “done by hand.” Although many chiropractors use tools or instruments in today’s society, the majority of chiropractors continue to follow the tradition of adjusting by hand only. Over 2500 years earlier, Hippocrates discovered the link between the body and the brain and called it the nervous system. Through his work, Hippocrates removed what he called ‘lesions’ from the spinal column and noted that illnesses cleared up faster. Those who came to him feeling sick, got well, and were sick much less often. Hippocrates advised, “Get knowledge of the spine, for this is the requisite for many diseases.” Through the years, this type of treatment of the spine was crude and misunderstood, and many cultures have been known to have ‘bone setters’ as healers. Chiropractic has focused on the ‘wellness’ of patients by reducing what Hippocrates called ‘lesions’ since 1895. Chiropractors call these lesions, ‘subluxations’ of the spine which cause nerve system interference. It is this simple concept that makes chiropractic the largest non-medical health care system in the world today.